The American Working Farmcollie, also known as the Old Farm Shepherd, (Old Shep) was once the most popular dog in the country. As descendants of the Old Scotch Collie, the farmcollies were versatile dogs, indispensable to farmers in the 19th and early twentieth centuries. During that period, it was this dog that most Americans thought of as a “collie”, although they were quite different from the AKC collies of today. The Farmcollie in this country quite likely also carried the blood of other types of herding and shepherd dogs that were brought here from Europe, but he remained a dog that clearly showed his Scotch Collie heritage. Like the Scotch Collies, the American Farmcollies excelled at herding, guarding (both livestock and the family), hunting and predator control. Their duties varied from protecting the baby from snakes to moving the bull. Over the years, however, the focus of American life moved from the homestead to the urban areas, and as small farms became swallowed up in larger corporate farms or urban sprawl, The need for this type of all purpose farmdog had all but disappeared. In its place came myriads of specialized breeds---companion dogs, hunting dogs, guardian dogs and herding dogs. Many descendants of the old Scotch Collies were registered with associations as English Shepherds, Border Collies, or Australian Shepherds. In Great Britain, the Border Collie, Collie, and Shetland Sheepdog continue to develop as other branches of this family. The Welsh Sheepdog or Welsh Collie, similar in some respects to the American Farmcollie, still exists in Great Britain. Many individuals of these different breeds today still retain the varied instincts and intelligence of their Scotch Collie forebears. In the 1980s, a few people that remembered the versatile old dogs began a search to see if any of them still existed. The breed was on the verge of extinction, but a few individuals still remained. An effort was then launched to locate other descendants of the Scotch Collies that retained the varied instincts of the old dogs so that the genepool could be enlarged in an attempt to bring back the farmcollie. The primary purpose of the American Working Farmcollie Association is to assist in this effort. The all round guardian/herding/hunting dog is like a herding dog in that he will herd on command for his master, but this instinct does not always set in until the dog is more mature, and is often slightly different than that of a “prey drive” herding specialist. When the working character is properly balanced and the dog is properly socialized to his master, the rules and routines of the farm, and the animals that live there, this dog will herd the animals to maintain order on the farm with little or no direction from his owner. For example, if the cows get out while the owner is absent, the dog drives them back in and sits in the gap until the owner returns to fix the fence. This dog also protects the animals from predators and eradicates vermin from the territory. 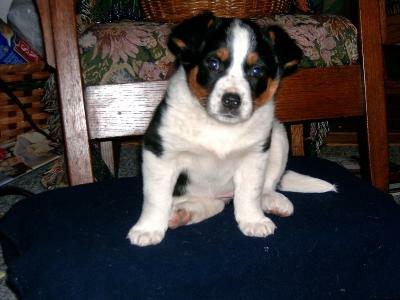 The AWFA was formed in 1998 by a few people who needed a good all round small farm dog. 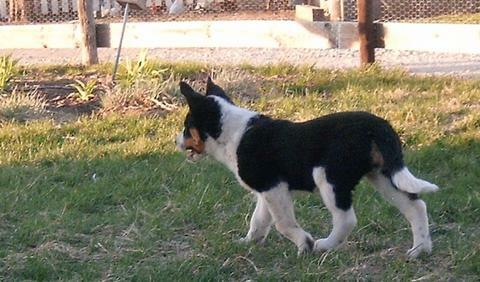 These dogs excel in three areas- herding, hunting and guardian. The dog we had in mind keeps order on his own territory without having to be told. Although we are great admirers of trial dogs, we recognized that something more than a trial was necessary to preserve the type of dog that works in this way. The all purpose American Working Farmcollies function like a bossy older siblings. The farmer tells the geese to “Shoo!” and the dog makes them mind. These dogs are seldom the ones that excel at trials- working strange livestock on strange territory, although some of them may be trained to function in that capacity as well. This necessity to read the farmer’s mind as well as the livestock has resulted in dogs that are exceptional at rating their stock and work them as gently as possible, or with as much force as necessary. Locating and identifying such all purpose working farm dogs is the primary purpose of the AWFA. A secondary purpose is to keep working farm instincts in all of the different breeds that descend from the Old Scotch Collie- in all of the genepools as defined by other registries. To qualify for permanent registration with the American Working Farmcollie Association, a dog must qualify in two of the three working areas. Double registration is encouraged, a dog may be registered as an English Shepherd, Australian Shepherd, Shetland Sheepdog, Kelpie, AKC collie, Border Collie, and also be permanently registered with the American Working Farmcollie Association based on his working evaluation. I like to think of AWFA registration as the 'Good Farmkeeping Seal of Approval'. Many of us hope to eventually have a breed that breeds true to the three working characters, and since this is a functionally defined breed, branches of this breed may still maintain their separate breed status. That is to say that there may be dogs with four generations of triple function working ability that still are purebred English Shepherds, Australian Shepherds, Collies, Shetland Sheepdogs, etc. Although this performance concept of a breed is unusual, population geneticists tell us that this will help us to maintain genetic health in perpetuity. Others of us are happy to have dogs that have only two of the three working characters, herding and hunting, for example, and use the American Working Farmcollie Association to record this working ability. 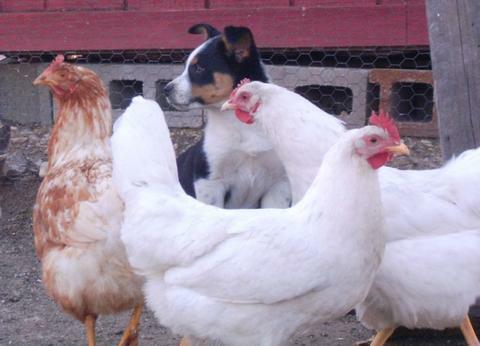 For more information about American Working Farmcollie Association, contact"
Aggi at 12 weeks with her chickens. Aggi at 12 weeks. At rest but watching the Muscovy ducks in the front yard. MOM! The ducks are in your flower garden!! MOM!! 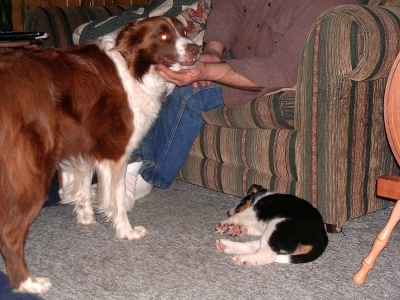 Heidi (Border Collie) and her 8 week pooped pup, Aggi (Border Collie X Blue Heeler). Would you like to be kept informed of what is happening at Muller's Lane Farm? New web pages? New products? Join MullersLaneFarm newsgroup by clicking the button below. 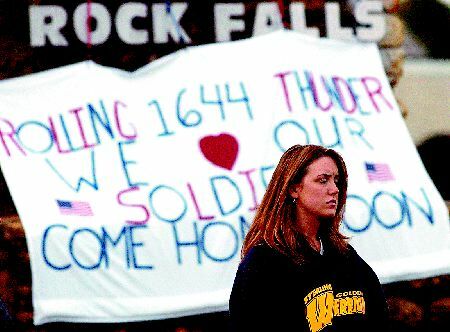 WELCOME HOME, October 15, 2005!! Muller's Lane Farm © 2002-2006.